Lancashire and Cumbria police forces have agreed to merge, on the final day of a Home Office deadline. 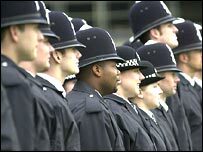 Home Secretary Charles Clarke proposed merging several police forces in England and Wales as part of a reorganisation of policing in the UK. The merger was the only one of the five proposed to be approved and will be presented to Parliament in May. Mr Clarke says merged forces are the best way to deal with threats such as terrorism, drugs and organised crime. The merger could take effect in April next year. But Pendle MP Gordon Prentice has warned that Lancashire council tax payers could lose out. An Association of Police Authorities spokesman said: "Pretty much everyone is against it." Shadow police reform minister Nick Herbert said: "In Cumbria and Lancashire there should be a proper consultation with local people - and possibly a referendum - to ensure that this is what the community wants and isn't simply a decision made by ministers and bureaucrats." Cumbria police authority chairman Reg Watson described it as a "momentous decision". He said: "The new constabulary will be much better placed to deal with the changing nature of criminality."